(Nanowerk News) Research biologists, chemists and theoreticians at the U.S. Naval Research Laboratory (NRL), are on pace to develop the next generation of functional materials that could enable the mapping of the complex neural connections in the brain ("Electric Field Modulation of Semiconductor Quantum Dot Photoluminescence: Insights Into the Design of Robust Voltage-Sensitive Cellular Imaging Probes"). The ultimate goal is to better understand how the billions of neurons in the brain communicate with one another during normal brain function, or dysfunction, as result of injury or disease. "There is tremendous interest in mapping all the neuron connections in the human brain," said Dr. James Delehanty, research biologist, Center for Biomolecular Science and Engineering. "To do that we need new tools or materials that allow us to see how large groups of neurons communicate with one another while, at the same time, being able to focus in on a single neuron's activity. Our most recent work potentially opens the integration of voltage-sensitive nanomaterials into live cells and tissues in a variety of configurations to achieve real-time imaging capabilities not currently possible." The basis of neuron communication is the time-dependent modulation of the strength of the electric field that is maintained across the cell's plasma membrane. This is called an action potential. Among the nanomaterials under consideration for application in neuronal action potential imaging are quantum dots (QDs) -- crystalline semiconductor nanomaterials possessing a number of advantageous photophysical attributes. "QDs are very bright and photostable so you can look at them for long times and they allow for tissue imaging configurations that are not compatible with current materials, for example, organic dyes," Delehanty added. "Equally important, we've shown here that QD brightness tracks, with very high fidelity, the time-resolved electric field strength changes that occur when a neuron undergoes an action potential. Their nanoscale size make them ideal nanoscale voltage sensing materials for interfacing with neurons and other electrically active cells for voltage sensing." 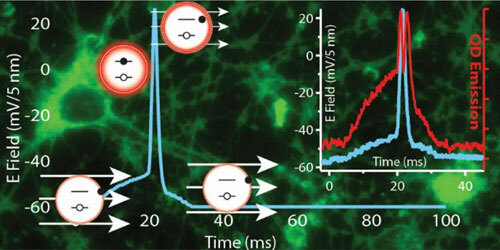 In their most recent work, the NRL researchers showed that an electric field typical of those found in neuronal membranes results in suppression of the QD photoluminescence (PL) and, for the first time, that QD PL is able to track the action potential profile of a firing neuron with millisecond time resolution. This effect is shown to be connected with electric-field-driven QD ionization and consequent QD PL quenching, in contradiction with conventional wisdom that suppression of the QD PL is attributable to the quantum confined Stark effect -- the shifting and splitting of spectral lines of atoms and molecules due to presence of an external electric field. "The inherent superior photostability properties of QDs coupled with their voltage sensitivity could prove advantageous to long-term imaging capabilities that are not currently attainable using traditional organic voltage sensitive dyes," Delehanty said. "We anticipate that continued research will facilitate the rational design and synthesis of voltage-sensitive QD probes that can be integrated in a variety of imaging configurations for the robust functional imaging and sensing of electrically active cells."